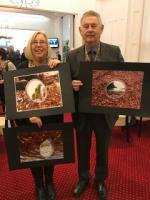 Rotary Club of Torquay - welcome! Please scroll/swipe down through this page to find out more about us, in addition to the pages linked in the menu, top-left. Youth competitions include Young Chef, Youth Speaks, Young Writer and Young Photographer. 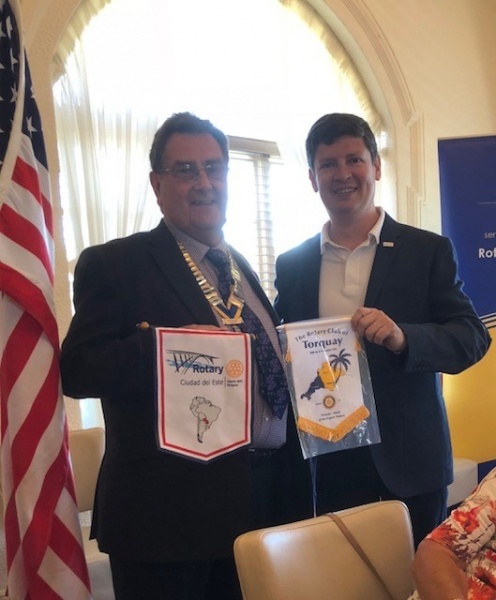 Torquay Rotary Club was formed in 1920 as the first club west of Bristol, and initially comprised 27 local businessmen with the Mayor of Torquay as President. It immediately identified the needs of Torbay Hospital (then in Higher Union Street) and began fund-raising initiatives on its behalf, which continue to the present day. In 1922 the club inaugurated a scheme for blue plaques on local buildings of note and two years later hosted clubs from all over Britain and Ireland for what was only their fifth ever conference. 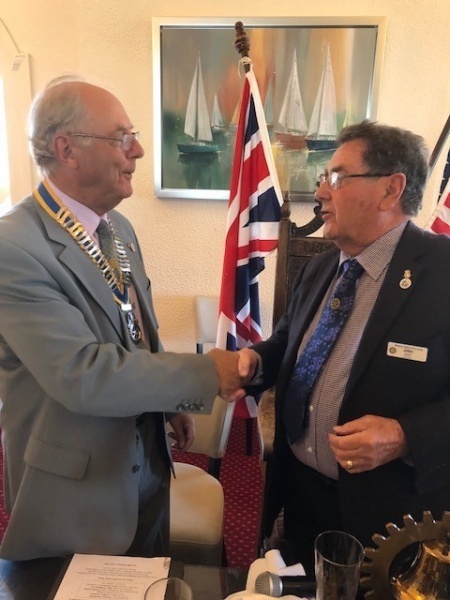 Immediate Past President John Slater hands over to President Roger Heath. We had a visit by two Rotarians from The Rotary Club of Ciudad del Este Paraguay- Arnaldo and Caroline Mendiate. President John exchanging banners with Arnaldo.